Edited by AlfWithCake at 21:16, 03 Mar 2018. Well in my case I make him stop, so I can grab gloves. And I prevent him from visit red tent. Can you disable placing portals before 1st castle is conquered to prevent this? Edited by Salamandre at 18:03, 27 Feb 2018. Can you post a save before that event please? Also try once without HD mod, just to see if there is not some conflict. Edited by AlfWithCake at 20:32, 05 Mar 2018. I think that may be a conflict with no-secondary-skill-limit plugin, but after I disabled it witch hut still gave me hidden skill when I declined paying, but you may ignore that. Save to be delivered. I tried without HD Mod, still exploit stays. Edited by Salamandre at 20:56, 05 Mar 2018.
ok I tried you save and it gives skill. Then I did F12 (load my scripts/plugins) and it didn't give. 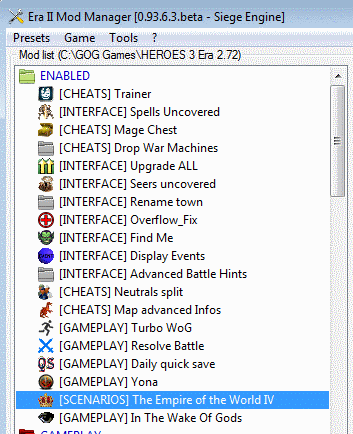 So there may be a difference in your mods AND active plugins which changes the way it behaves. Compare with your and tell me please where is different. Also don't forget that when you disable mods then load old save, you must press F12 in order to load new configuration. ok I found where is the problem, is secondary skills scrolling mod. As soon as I enabled, it allows new skills even if my scripts exit. Good to know, so up to you to continue and get them for free or disable that mod. Personally I never use it. Yes, I did press F12 to update scripts all these times. I changed the plugins to match yours, still witch hut teaches me. In addition to your mods I use "Bigger Spellbook", "New Commanders", "Mentoring", but I don't use "Display Events", "Find Me", "Drop War Machines", "Mage Chest", "Spells Uncovered", "Trainer". In your save, secondary skills scrolling IS active. When I deactivate it, witch hut don't teach. how did you get that large of a screenshot? is that how your game looks while playing it? what are you running to have that large a playable view? i was under the impression that the hd mod makes everything smaller, but the objects in your screen looks like the same resolution as mine. From what I can tell from the image sizes, he's probably playing on a laptop, with a 1366x768 screen, which isn't that much larger in height than the normal 800x600 Heroes 3 screen, so objects shouldn't appear that much smaller. By contrast, a fullhd screen (1920x1080) is almost twice as big in height as 800x600, so objects would appear almost twice as small than normal. @salamande Oh yeah, missed it, seems to be the problem. @fred alyx got it right, it just seems that HD mod doesn't decrease objects, but they got not as small as with 1920x1080 resolution. Edited by AlfWithCake at 11:15, 09 Mar 2018. I like this new horshoe artifact, really good when you need to hang just a little with Commodus. I like this new horshoe artifact, really good when you need to hang just a little wit Commodus. What bonus does it give? Edited by AlfWithCake at 11:13, 09 Mar 2018. It conserves movement points that are left at the end of the day, so you may accumulate a huge amount of movement points just by clicking "End Turn" if you want. There're new artifacts sal made, I discovered only 2 yet: this horshoe (you can get it near Zubin) and boots that give 2k movement points (in area that is accessible after you defeat Rissa). Edited by tevez at 12:12, 09 Nov 2018. Already fixed it, just add debug/era folder. Now im playing twe 2 first.